While several Thanksgiving dishes call for onion – stuffing, for example – the onion is certainly not the star. So, four sweet onions remaining in the refrigerator after the holiday called out to be featured in one of this weekend’s dinners. 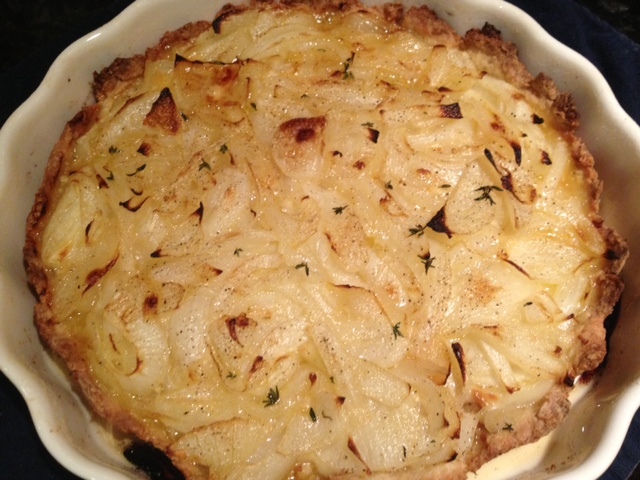 As I was not yet ready for a decadent onion soup, I decided on an onion tart. Below is my recipe for this savory tart. To prepare the crust, mix the flour, salt and sugar in a large mixing bowl. With a sharp knife, cut the butter into small cubes and add to the dry ingredients. Rub the pieces of butter and the dry ingredients together with your fingers until the butter is broken into tiny pieces. Add the egg and mix it into the dry ingredients with a fork. Then drizzle in the iced water. Begin to knead the dough quickly into a ball. Add more iced water until the dough is just wet enough to form a ball. Wrap in plastic wrap and chill in the refrigerator for several hours. When you are ready to start putting the tart together, preheat the oven to 425 degrees. Place two tablespoons of olive oil and two tablespoons of butter in a large sauté pan on medium heat. When the butter is melted, add the onion and sauté until the onion softens, about 10 minutes. Season with salt and pepper to taste. On a lightly floured surface, roll out the dough and add flour to prevent the dough from sticking to the rolling pin and the work surface. 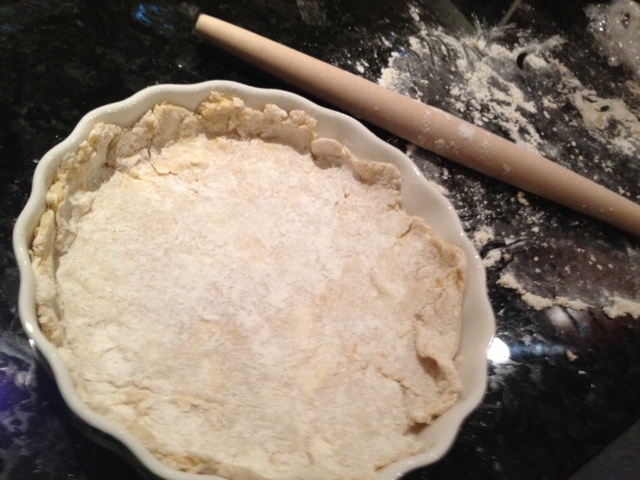 Roll the dough until it is about ¼ inch in thickness and large enough to cover the bottom of a 9 or 10 inch tart pan. Prick the crust with a fork in several places to prevent the bottom from bubbling. Pre-bake the crust in the middle level of the oven for 10 minutes. Remove the crust from the oven and turn down to 400 degrees. Spread a thin layer of mustard on the bottom of the tart shell. Then place slices of the cheese on top of the mustard. Top with the onion mixture and some fresh thyme. Bake for about 45 minutes or until the crust is golden brown. Remove from the oven and slice into wedges. 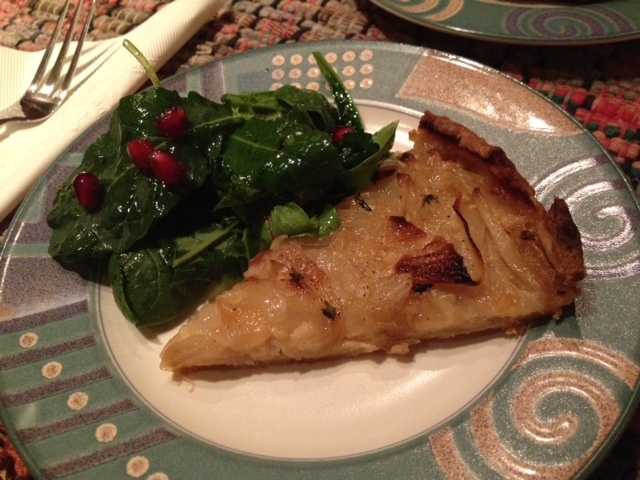 Enjoy the tart alongside a salad of fresh greens and pomegranate seeds for a colorful dish. This entry was posted in Uncategorized and tagged Butter, Cheese, Emmentaler, Food, French, Gruyere, Mustard, Onion, Recipe, Tart, Thyme. Bookmark the permalink. This is something that I might be able to try! Pictures? Pictures did not post on my link but I see them here on the comment page. My compliments to the photographer! Thanks, Lynda…I received photography tips from an expert! I will be making this tonight! Any suggestions on wine pairings…ah forget about it…school night. Thanks for your comment, Erin…I’ll look forward to hearing about your onion tart tomorrow! And I recommend a glass of Cote du Rhone even though it is a school night.